Debt funds: Better alternative to FDs? 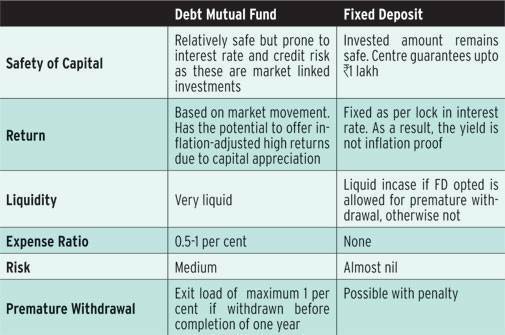 Debt mutual funds could give you better returns compared to bank fixed deposits as India heads for a low interest rate regime. But be informed. The love for fixed deposits (FD) among Indians is second to none and, that too, at the expense of other savings avenues, including mutual funds. The strong association with FDs, however, can be attributed to the fact that they are easy to understand, offer reasonably high interest rates, are relatively safe and, finally, provide guaranteed return at maturity. But then, as we enter a low interest rate regime with the Reserve Bank of India hinting at further cuts in key policy rates, we may be better off looking beyond fixed deposits. Since January 2015, the RBI has already cut rates by 150 basis points. Low inflation and the promise of a good monsoon could open up room for another 25 bps cut. Consequently, banks are sure to cut deposit rates further. But then lower monthly interest income on fixed deposits, which usually helps senior citizens meet regular expenses, or lower returns, say, for over a three- or five-year period, for working individuals could throw a spanner in the works of anyone's financial plans by a fair margin. This is where debt MFs could make a difference. But, as always, it would be prudent to first know how debt funds work before you invest and then decide whether, in spite of the falling rates, FDs are your only option or not. So, here you go. Finance Minister Arun Jaitley has clearly said, time and again, that interest rates will be heading south, given the fact that fiscal deficit is coming down and inflationary pressures are easing. The RBI also seems to be comfortable with inflation numbers and in its most recent monetary policy review in 2016/17 cut the lending rate to 6.5 per cent. "The key variables impacting interest rate seem currently favourable. With inflation on decline, indications of a normal monsoon this year would tend to offer further respite to inflation," says Lakshmi Iyer, CIO (Debt) and Head of Product, Kotak Mutual Fund, adding: "The monetary policy continues to be accommodative, which means further easing cannot be ruled out. We, therefore, remain constructive on interest rates in India and do expect further easing over the next 6-12 months." Debt funds invest in fixed income instruments, including government bonds, corporate deposits and money market instruments that are generally considered safe. Debt MFs are valued on the basis of their net asset values (NAVs), which change on an everyday basis like equity mutual funds. The current opportunity for debt funds stems from the fact that interest rates and bond prices are inversely related, that is, when interest rates fall bond prices rise. Says Anil Chopra, Group CEO and Director, Bajaj Capital: "Unlike fixed deposits, debt mutual funds help investors get capital appreciation (from bond price rise) in a falling interest rate scenario." There are primarily three risks associated with debt funds: liquidity is a concern and so is credit risk - the possibility of a default by the investee company - apart from risks associated with interest rates. Government bonds that offers sovereign guarantee are, however, considered the safest. Papers with AAA, AA and A ratings are also considered safe. In recent times, the Amtek Auto bond credit risk wrecked havoc for two debt schemes of JP Morgan Asset Management (India). On a global scale, the 2008 financial crisis was triggered by credit defaults in mortgage debt. However, historically, there have been very few incidents in India where debt funds have put investors in jeopardy. However, despite the risks compared to FDs, debt funds cannot be ignored. 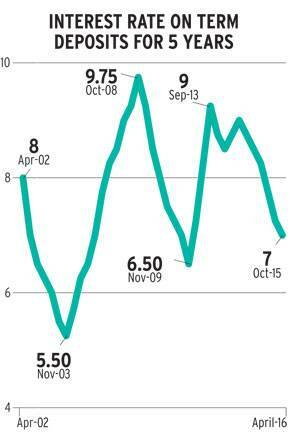 Debt fund scores over FDs when it comes to paying taxes. According to the Income Tax Act of 1960, interest income from FDs is added to an individual's total income and is taxed according to his or her tax slab irrespective of the investment tenure, making it highly tax inefficient. For Debt funds, tax is, however, calculated on the basis of short-term and long-term capital gains. For investments between one and three years, the tax treatment is similar to that of FDs. However, if the investment tenure is over three years a flat rate of 20 per cent is taxed, after claiming the benefit of indexation. Further, dividend income from debt MFs is tax-free. Deepesh Raghaw, a Securities and Exchange Board of India (SEBI)-registered investment advisor, says after a period of three years there is hardly any tax outgo after indexation on debt funds. "This is a huge advantage, especially for individuals in the 20-30 per cent tax brackets." Therefore, it is widely recommended that individuals in the higher income brackets should keep away from hoarding FD papers, because after considering inflation and tax deduction, the yield sometimes can turn out to be negative. Some FDs allow premature withdrawal, while there are others that do not. And accordingly, interest rates vary. For instance, if you invest in a five-year fixed deposit of say, `5 lakh, that does not allow premature withdrawal, but you have an urgent requirement of `3 lakh, you will not only be able to make a partial withdrawal, but will also have to pay a penalty in the form of a reduced interest of up to 1.5 per cent. However, in case of a debt fund, after a one-year lock-in period the investor has the option to redeem the number of units amounting to the required sum and, that too, without a penalty. If the investment duration was less than one year, an exit load of up to 0.5 per cent would be levied. Though this may sound a bit odd, the truth of the matter for FDs is that irrespective of whether you encash the interest income or not, you will have to compute the gain on a yearly basis and pay tax accordingly. So, there are some calculations to be done. However, in the case of debt funds, tax has to be paid only on redemption. Raghaw is of the view that if the deposit is only for one year, irrespective of the tax bracket an individual belongs to, it's better to stick with fixed deposits. The logic here is to escape short-term volatility that may lower the NAV of fund. 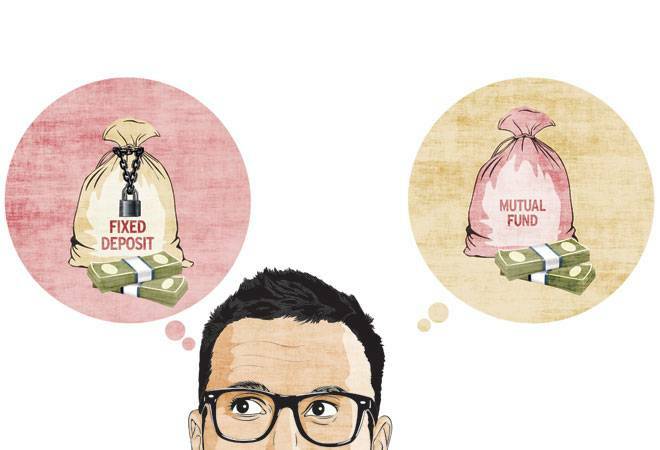 However, if the duration is three to five years, debt mutual funds prove to be a much better bet than fixed deposits, says Chopra. "Even though corporate deposit is an option that can be considered, but there is always a fear of default risks. Moreover, they do not benefit from downsides in interest rates and comes low down on the pecking order when it comes to seniority of debt." Iyer is of the view that "3-5 year is a good horizon to stay invested in strategies that try to optimise one's portfolio return". Her advice to the investors is to look at income funds that invest in a combination of government securities and corporate bonds, which are popularly known as duration funds. "While they are a tad volatile, since the intended time horizon is upwards of three years, these could be looked at." Additionally, one could also consider 'accrual' funds which invest largely in corporate bonds with maturities typically ranging between two and four years. These tend to be less volatile and also tend to have a higher portfolio yield as they invest predominantly in corporate bonds. For senior citizens, if the income earned is below the threshold limit for taxation, then it is best to stick to FDs. But, for those in the higher tax bracket, it becomes very important to select the right kind of debt fund. And this is a very tough task as there are hundreds of funds available. "Apart from selecting a fund, it is also important for senior citizens to check the product comfort and the kind of inherent risks before investing. Incomplete information or inadequate understanding can lead to unwarranted confusion, which can lead to disastrous money churning," warns Raghaw. The debate on FDs versus debt funds, therefore, is less a debate and more about taking an informed decision depending on where you stand and what are your immediate and long-term requirements, besides, of course, your risk-taking ability.